-Brandon Lawson sums it up pretty good with a quote from his webpage,"On November 21st, in the basement of Brandon Lawson's house, Pseudo Star and Merge held a small invite only concert. It was a great show and everyone had a great time. It was a very funny and personal show since there were only 25 people there. Pseudo Star played very very well and included some of their great originals like Plum 54, Wrong, Lyle Penny'sworth and Green Apples. The Pseudo's ended their set with a 15 minute version of Fugazi full of very interesting effects and playing styles including Matt shoving a drum stick under his strings and bending (he only broke one string which is amazing). Fugazi then went directly into Extremely All The Time. All in all Pseudo Star played a great show and seemed like they had a great time. Next, Merge went up and played a solid set of originals and cover songs. Some new songs also were brought out for the show. Untitled was played as an instrumental for unknown reasons but went over really well. The crowed really seemed to enjoy the guys and the jokes and pointless talking inbetween songs." Some interesting 'jamming' went on after Merge's set which included some Jimi Hendrix with Matt and Craig of Pseudo Star on vocals. Thank you Brandon's Mom for letting use the house, and everyone for coming out. Look for another concert like this in the future. 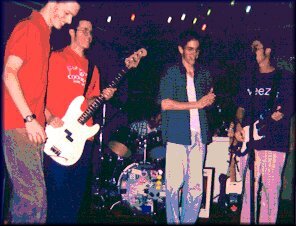 Band(Merge and Pseudo Star): Rob Welsman, Charlie, Brandon Lawson, Craig.